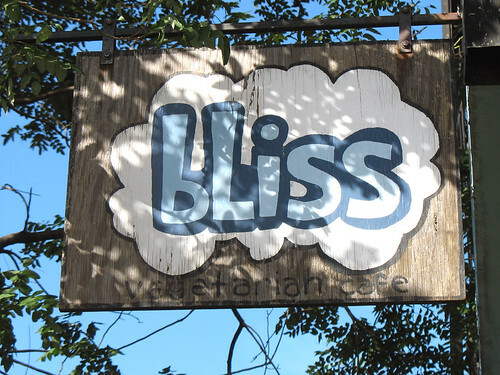 Another spot on my list of veggie burgers to try in Williamsburg – Bliss Café is a cute little vegetarian/vegan restaurant on Bedford Avenue that I had probably walked past numerous times without noticing before. Once I finally ventured inside, it was cozy and warmly-lit by the sunlight coming through the big front windows, and the whole place exuded a very friendly vibe. 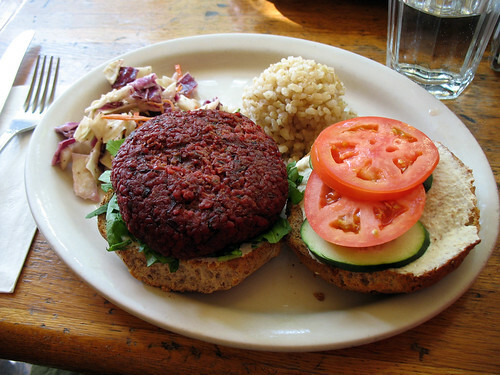 The veggie burger (which is vegan) is described as a “homemade patty with tomatoes, cucumbers, spinach, and vegan mayo. 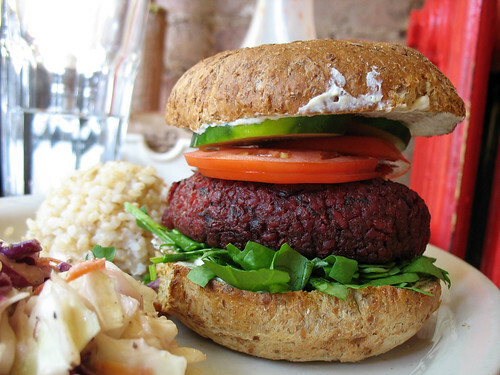 Served on organic sprouted whole-wheat bun.” It comes with a side of cole slaw, and your choice of either corn chips or brown rice. look how tall that thing is when it’s all stacked together! It certainly did not disappoint – the patty was thick and soft, and I had to squish it down in order to take a bite. It stayed together well and oozed over the edges but did not fall apart or slide out of the bun. Based on the coloring I assume beets were one of the ingredients, but everything was chopped up very small and so well blended together that it was hard to identify other components of the mash. I tasted beans, and rice or other grains, onions, and probably other vegetables too. The whole thing tasted a bit like a vegetarian chili, actually. It could have been a bit more strongly-flavored, either spicier or sweeter, and I have a preference for burgers that are a bit crisper on the outsides, but those were minor criticisms. The fresh spinach was a nice alternative to standard iceburg lettuce, and the cucumbers gave it a crisp crunch. 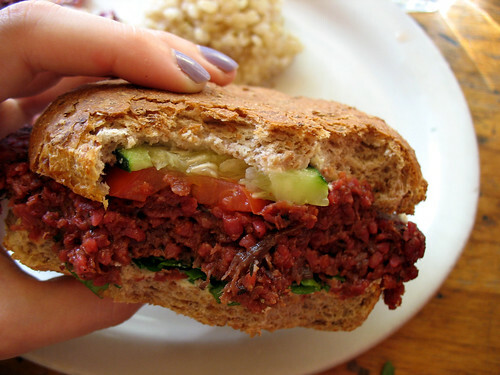 I didn’t really taste the vegan mayo, although I did observe it on the bun. Speaking of which, the bun was quite tasty – maybe a little to crusty, but the flavor was perfect. I also took a peek at the vegan breakfast items on the menu, and they sounded delicious… so I’d definitely come back to try brunch here sometime as well.